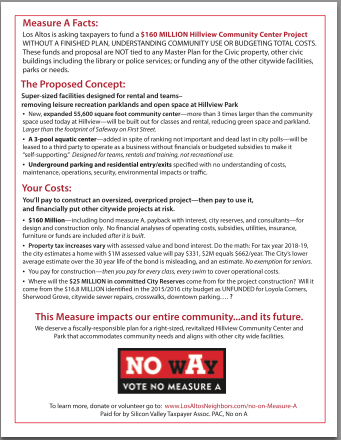 HELP SPREAD THE WORD - NO ON MEASURE A.
DowNLOAD and PRINT. AND THEN SHARE with Your Neighbors!! Download and print this window sign to place in your home or business window. It is ready to print in a pdf file on an standard 8-1/2 x 11 page. Download and print out this window sign to show your support of No on Measure A. It is ready to print in a pdf file on a standard 8-1/2 x 11 page. 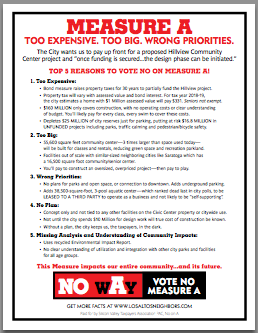 Looking for a one page No on Measure A piece to share with your neighbors? 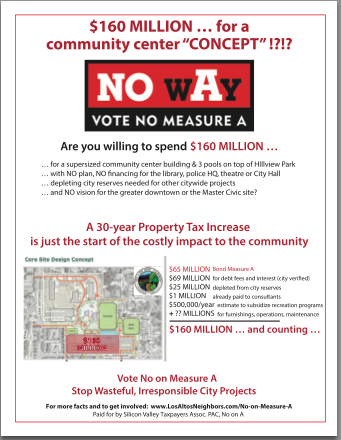 This piece addresses the top 5 reasons to vote No on Measure A, with some call out facts and issues surrounding the proposed Hillview Community Center project-----supporting points for Too Big, Too Expensive, Wrong Priorities and more. You can inexpensively print this out in black and white to meet your needs and printer. Print and share with your neighbors! Perfect for a leave behind or to help detail the issues and facts surrounding Measure A ----concept elements, costs and impact. Breaks down the costs of the $160 Million and counting for construction. And also frames the concept and the costs for this project. Provides a top line summary of the issues and detail of the $160 MILLION construction only costs. Provides detail on the facts of the concept, costs and impact to Los Altans and city finances.